Portrayers: Alexandra Wilson, June 6, 1988 - November 29, 1990; December 25, 1990 - February 25, 1991. 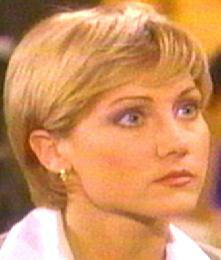 Amy Carlson, December 31, 1993 - January 6, 1998. Nadine Stenovitch, February 17, 1998 - June 25, 1999. Arrival: (1988) Came with her mother Sharlene Frame to escape from a bad crowd in Chadwell, Oklahoma. (1993) Returned to avoid her madam. Departure: (1991) Left to pursue an acting career. Introduction Scenes: (Alexandra Wilson) (June 6) Voice only to Matthew Cory, "This is Riviera. Operator?" (June 10) In her bedroom to herself about Matthew Cory, "Pretty sure. No, no, there's never any harm in keeping him waiting." (Amy Carlson) The New Year's Eve ball, to Matthew Cory, "Hi, Matt. I wanted to surprise you." (Nadine Stenovich) To Gary Sinclair, who was prowling around their apartment wielding a baseball bat, "Gunning for a grand slam, slugger?" Exit Scenes: (Alexandra Wilson) The Frame farmhouse porch, to Matthew Cory about the perfect woman in his future, "Whoever she is, she's gonna be lucky." (Amy Carlson) Hugging and kissing Gary Sinclair in their bedroom. (Nadine Stenovitch) Toasting with Gary Sinclair in Foster Park, "To tomorrow." Birthday: The 2nd of the month, 1972 or 1973. Other Aliases: Josephine Anne Watts (full name). Josie had a nose job in 1990 to further her modeling career. In real life, the actress had had the operation to fix a defect in her nasal passages. She had chicken pox in 1993. She was shot by Blair Baker in 1996, which left her without her left ovary. The experience also traumatized her on a psychological level. In 1997, Josie miscarried in her fourth month after being pushed out of a window five stories above the ground and landing on a trampoline. Josie got her big break in 1990 when she broke into the modeling world. She left Bay City in December of that year to pursue an acting career in Hollywood. When she returned to Bay City, she revealed that her success was short-lived. She had been so upset at the lack of jobs, and devastated at the recent loss of her mother, Josie had found herself slowly sucked into the world of high-class prostitution. She returned to Bay City vowing never to work for her madam, Bonnie Broderick, again. Bonnie followed her to Bay City, but Josie, with Ian Rain's help, was able to break free for good. In 1995, Josie helped the police nab the person who had been beating prostitutes. The experience affected her so deeply that she decided she wanted to become a police officer. She entered the police academy and several months later emerged as Officer Watts. Over the next few years she would demonstrate herself to be one of the worst officers in the history of the force. In 1996, after struggling with a perp, his gun went off accidentally, killing him. For this she received a commendation. In 1997, she did a background check on former officer Eddie Carlino, and she attempted to shoot a crazed Commissioner Raines from within an air shaft. Despite having a clear shot, and despite being one of the best sharpshooters in the history of the police acedemy, Josie still missed. It was up to Joe Carlino to nail Raines with a wild shot. Yet, she was not only commended, but promoted for her actions. Josie continued to disgrace herself with lousy performance and outright stupidity. In 1996 she resigned when she felt herself mentally unfit for duty. Subsequent courage under fire restored her abilities and her job. In 1997, Josie found she could not tolerate her partner Gary's habit of breaking the rules in his investigations. She asked for and received a transfer to the commissioner's office. Over the next few months she was back working under the captain, though her return to police duty was never explained. In the fall of 1997, Josie received her third medal for capturing Chip Rayburn, even though her actions had been deplorable.